I know this is not my best work, but I was just playing around the tapes just to get into the hang of it. I think that cuticle scissors are the best to cut the tape because you can cut it at a curve, which would align with the sides of your nails better. I also find there is more accuracy because of the shorter blades. For me, it was a little more awkward to cut it with medium sized scissors! On my thumb, pointer, and pinky are various ways to work with straight lines. You can do it horizontally, diagonally, or make plaid pattern out of it! I'm thinking Burberry! On my middle finger, you can use striping tape to create straight edges. Finally, you can create a modern half moon manicure by allowing the tape to overlap to create a triangle. Make sure you apply top coat to seal in the tape. It's definitely not sticky enough to stay on its own. Anyways, I'm looking forward to using these striping tapes in future nail art! 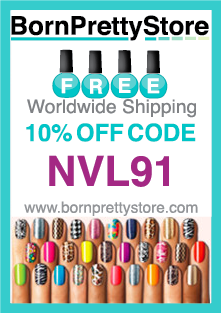 Bornpretty is the best, i also recently got my goodies from them!! This is awesome, I've never tried the tape on nails but will def have to. 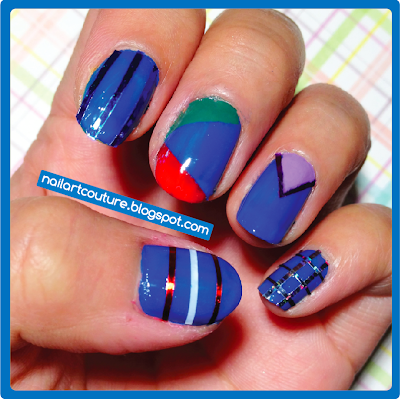 So cool I love how you used the nail striping! I'll definitely check that website out I am a sucker for free shipping on anything! Yeah, expensive shipping is such a deal breaker for me!